When shopping for a VNA system, there are many choices, and it can be difficult to decide which one is right for your organization. 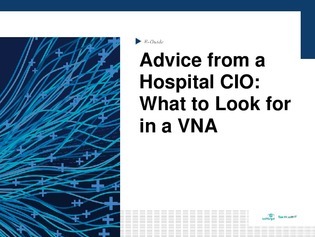 In this e-guide, uncover advice from James Wellman, CHCIO, CIO at Comanche County Memorial Hospital in Lawton, Oklahoma. Explore this Q&A which includes personal experiences, and what James thinks healthcare organizations should look for in a VNA system and vendor.